Crumb is an annotation processor that exposes a simple and flexible API to breadcrumb metadata across compilation boundaries. Working with dependencies manually is usually fine, but there's often cases where developers will want to automatically gather and act on information from those dependencies (code generation, gathering metrics, etc). Tools like ServiceLoader can solve some cases like this, but lack flexibility and can be slow at runtime. This is where Crumb comes in. Crumb's API is an annotation-based, consumer/producer system where extensions can opt in to consuming or producing metadata. Extensions run at compile-time to produce or consume this metadata, while Crumb's processor manages this metadata for them (serializing, storing, retrieving, orchestrating the data to appropriate consumers, etc). This allows developers to propagate arbitrary data across compilation boundaries. More in-depth examples can be found at the bottom of this README. @CrumbProducer - This annotation can be used on custom annotations to signal to the processor that elements annotated with the custom annotation are used to produce metadata. @CrumbConsumer - This annotation can be used on custom annotations to signal to the processor that elements annotated with the custom annotation are used to consume metadata. @CrumbQualifier - This annotation can be used on custom annotations to indicate that elements annotated with the custom annotation are relevant for Crumb and used by extensions. @CrumbConsumable - A convenience annotation that can be used to indicate that this type should be available to the Crumb processor and any of its extensions (since processors have to declare which annotations they support). There are two extension interfaces that follow a Producer/Consumer symmetry. The API (and compiler implementation) is in Kotlin, but seamlessly interoperable with Java. The API is SPI-based, so implementations can be wired up with something like AutoService. Both interfaces extend from a CrumbExtension base interface, that just has a method key(). This method has a default implementation in Kotlin that just returns the fully qualified class name of the extension. This is used to key the extension name when storing and retrieving metadata. The API usually gives a CrumbContext instance when calling into extensions, which just contains useful information like references to the ProcessingEnvironment or RoundEnvironment. supportedProducerAnnotations() - Returns a set of supported annotations. Has a default implementation in Kotlin (empty), and is used to indicate to the compiler which annotations should be included in processing (since annotation processors have to declared which annotations they need). isProducerApplicable(context: CrumbContext, type: TypeElement, annotations: Collection<AnnotationMirror> - Returns a boolean indicating whether or not this producer is applicable to a given type/annotations combination. The annotations are any @CrumbQualifier-annotated annotations found on type. Extensions may use whatever signaling they see fit though. produce(context: CrumbContext, type: TypeElement, annotations: Collection<AnnotationMirror> - This is the call to produce metadata, and just returns a Map<String, String> (typealias'd in Kotlin to ProducerMetadata). Consumers can put whatever they want in this map (so be responsible!). The type and annotations parameters are the same as from isProducerApplicable(). supportedConsumerAnnotations() - Returns a set of supported annotations. Has a default implementation in Kotlin (empty), and is used to indicate to the compiler which annotations should be included in processing (since annotation processors have to declared which annotations they need). isConsumerApplicable(context: CrumbContext, type: TypeElement, annotations: Collection<AnnotationMirror> - Returns a boolean indicating whether or not this consumer is applicable to a given type/annotations combination. The annotations are any @CrumbQualifier-annotated annotations found on type. Extensions may use whatever signaling they see fit though. consume(context: CrumbContext, type: TypeElement, annotations: Collection<AnnotationMirror>, metadata: Set<ConsumerMetadata>) - This is the call to consume metadata, and is given a Set<Map<String, String>> (typealias'd in Kotlin to ConsumerMetadata). This is a set of all ProducerMetadata maps discovered on the classpath returned for this extension's declared key(). The type and annotations parameters are the same as from isConsumerApplicable(). Crumb's core functionality can be leveraged independently from the compiler artifact via the crumb-core artifact. This can be useful for integration within existing tooling, and contains a CrumbManager and CrumbLog API. The crumb-compiler artifact is an advanced frontend over this utility. CrumbManager has a simple load and store API, and CrumbLog is a logging mechanism to help with debugging issues. Note that this is only when consuming data in a plain Kotlin project. Android projects work fine. To demonstrate the functionality of Crumb we will have a hypothetical plugin system that automatically gathers and instantiates implementations of the Translations interface from downstream dependencies. Conceptually this is similar to a ServiceLoader, but at compile-time and with annotations. To prevent a traditional approach of manually loading the implementations, Crumb makes it possible to automatically discover and utilize the Translations classes on the classpath. The plugin implementation then needs to be registered into the plugin manager upstream. A Crumb extension can convey this information to consumers of the library by writing its location to Crumb and retrieving it on the other side. For this example, a custom @Plugin annotation is used to mark these translations implementations. Crumb will take the returned metadata and make it available to any extension that also declared the key returned by key(). annotations are the @CrumbQualifier-annotated annotations found on that type. For simplicity, all holders are required to have a static obtain() method. For the consumer side, our example will have a top-level TranslationsPluginManager class that just delegates to discovered downstream translations. With a ConsumerExtension, downstream services can be consumed and codegen'd directly with JavaPoet. For simplicity, this manager will follow an auto-value style pattern of having an abstract class with the generated implementation as a subclass. Crumb can be wired in here. The symmetric counterpart to @CrumbProducer is @CrumbConsumer, so this example uses a similar @PluginPoint annotation here for consuming. This time it's annotated with @CrumbConsumer to indicate that it's for consumption. 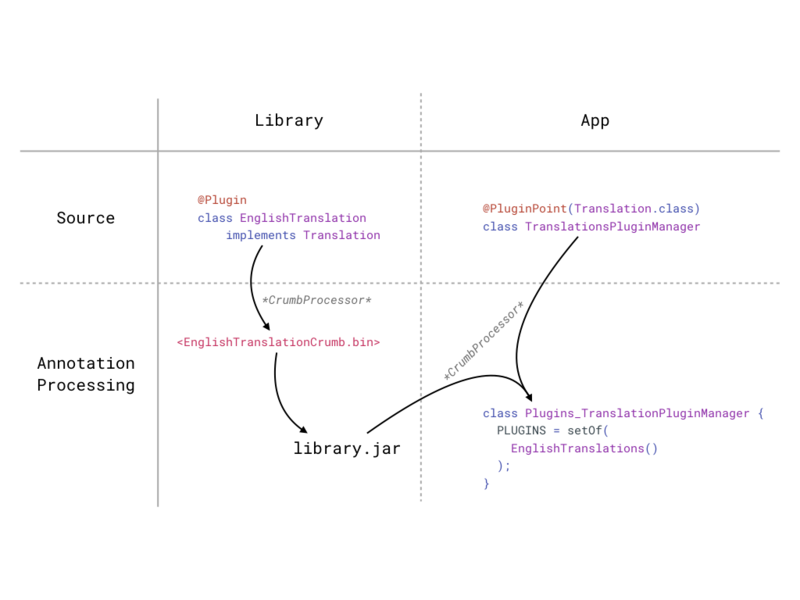 This is then added to the manager class, specifying the Translations class as its target interface so that it only registers implementations of that interface. Note that both extension examples are called PluginsCompiler. Each interface is fully interoperable with the other, so it's possible to make one extension that implements both interfaces for code sharing. The complete implemented version of this example can be found under the :sample:plugins-compiler directory. There's also an example experiments-compiler demonstrating how to trace enum-denoted experiments names to consumers.